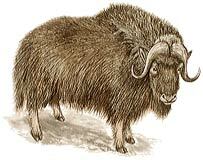 In prehistoric times, the musk ox was found throughout northern Europe, Siberia, and North America. It was largely exterminated, surviving only in northern Canada and Greenland; however, it has now been successfully reintroduced in Norway and Alaska. It is the only species in its genus. The musk ox is superbly equipped for life in harsh arctic conditions, for it has a dense undercoat which neither cold nor water can penetrate and an outer coat of long, coarse hair that reaches almost to the ground and protects it from snow and rain. The broad hoofs prevent it from sinking in soft snow. Both sexes have heavy horns that almost meet at the base, forming a broad frontal plate. Facial glands in the bull emit a strong, musky odor in the rutting season, hence the animal's name. 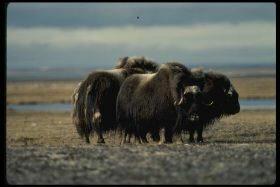 Musk oxen are gregarious, living in herds of as many as 100. In the mating season, young bulls are driven out by old, master bulls and form small bachelor groups or remain solitary. The female produces 1 young after a gestation of 8 months. When threatened, musk oxen form a circle, facing outward with horns lowered, with the young in the middle; this is an effective defense against wolves, their natural enemies, but not against humans with guns. Musk oxen feed mainly on grass, but they also eat mosses, lichens, and leaves and will dig through snow for food.